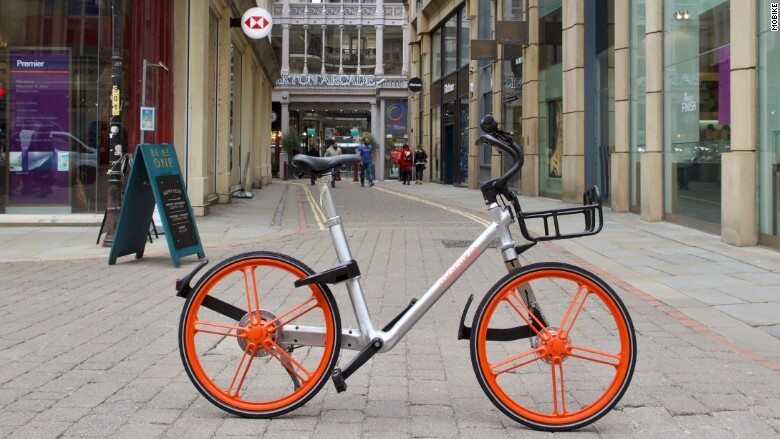 One of China's largest operators, Mobike, unleashed 1,000 of its orange-wheeled bicycles in the rainy English city of Manchester. The companies are rolling into the U.K., the U.S. and beyond, aiming to disrupt existing programs with their fleets of colorful bikes that don't need docking stations. One of China's largest operators, Mobike, unleashed 1,000 of its orange-wheeled bicycles in the rainy English city of Manchester on Thursday, marking its first foray outside of Asia. "Manchester will be a springboard into Europe," said Chris Martin, the company's head of international expansion. Bike sharing has become a global business, with about 1,000 operations dotted around the world. The industry is expected to be worth as much as $5.9 billion by 2020, according to a report last year from research firm Roland Berger. Analysts say the Chinese model is a game changer. The bikes can be locked and unlocked anywhere via a smartphone app, which means users don't have to return them to designated stations. The rapid spread of this approach across China has already thrown up problems, including mountains of discarded bikes and companies going bust. Impounded Mobike and Ofo bikes in Shanghai. Mobike and Ofo are the country's two biggest bike-sharing startups, each valued at well over $1 billion. Mobike's backers include tech giant Tencent (TCEHY) and Apple supplier Foxconn. Ofo is funded by big names such as Alibaba (BABA) and China's equivalent of Uber, Didi Chuxing. After expanding into other Asian cities last year, the Chinese bike startups are now ready to take on the West. "We are definitely serious about international expansion," Ofo COO Zhang Yanqi said. "The last mile issue for city commuters is a global problem to solve," he said. China's bike-sharing craze has been driven by users grabbing rides for the so-called "last mile" of their commute, from the subway station to the office, for example. Mobike also touts itself as a last mile solution. It currently operates in 130 cities, mostly in China, and plans to increase that number to 200 by the end of the year, mainly by expanding into more foreign locations. The company wants to prove that its bike-sharing model "is a global one," said Martin. As they battle for customers, both companies have been offering rides at bargain prices. After paying deposits between 200 and 300 yuan ($29-$44), users can hop on a bike for as little as 1 yuan (15 cents). In Manchester, Mobike rides start at 50 pence (65 cents). While the cheap rides raise questions about whether the business model is sustainable, some observers say Mobike and Ofo can go a long way with their current momentum. "If you've got hyper adoption, you've got a consumer phenomenon," said Jeffrey Towson, a private equity investor and professor at Peking University. "You can figure out how to make money later." The startups' success helped spawn a host of smaller players that have blanketed Chinese cities with millions of dockless bikes. Companies have had problems with users stealing or vandalizing bikes, parking them in apartments or hiding them for personal use. One local firm, Wukong Bikes, shut down last month, saying it had lost or could not account for 90% of its bikes. To try counter those kinds of problems, Mobike and Ofo track their bikes through GPS and penalize users who hide bikes or park them in inaccessible places. 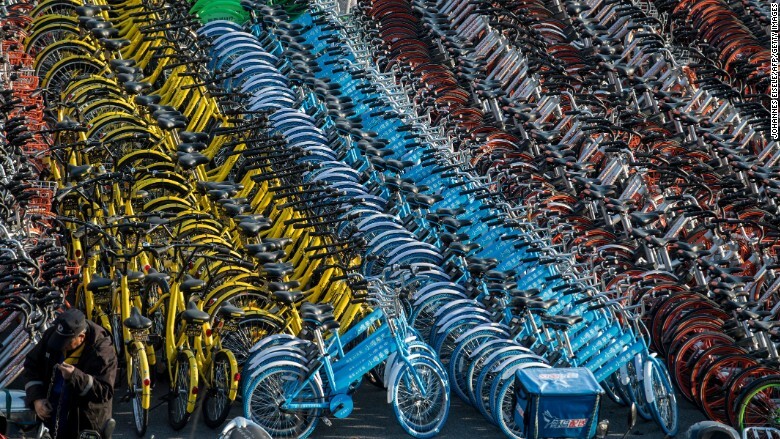 China's bike-sharing bonanza has led to jumbled piles of bikes dumped outside subway stations and other popular areas. Both Mobike and Ofo say they constantly tweak the locations of their fleets, either deploying workers to physically move the bikes, or offering users discounts or free rides to pedal them to certain areas. 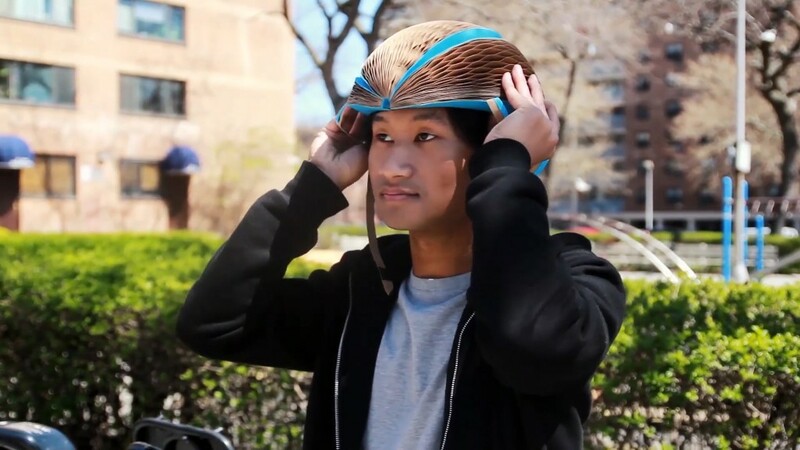 Prodding users to help redistribute their bikes is possible thanks to the data Mobike and Ofo collect on the millions of people who use their service daily -- they know when bikes are sitting idle, and when high traffic areas need more service.